Discover how happiness affects our view of ourselves, the choices we make, our purpose in life, and also why God allows suffering. As Aristotle and many other major philosophers have observed – Happiness is the one thing you can choose for itself. Everything else is chosen for the sake of happiness. Happiness affects our view of ourselves, our purpose, what we pursue in life and career, who we choose as friends and spouses – just about everything we believe and hold dear. 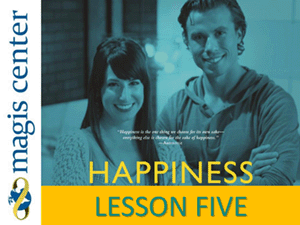 In this 7-volume series hosts Eric Kaiser Johnson and Jennifer Milani lead viewers through an entertaining tour-de-force of happiness. While this sounds compelling, this line of thinking is actually built on ignorance of the facts, and faulty logic. This particular myth is addressed piece by piece with Happiness, The Series. All Magis Center materials are aligned with the USCCB-Curriculum Framework and the Catechism of the Catholic Church. What is happiness — and how can we be optimally happy? What makes life worth living — and even optimally worth living? Do we have a eternal soul through which God calls us to himself? Why does God allow suffering — and how can we suffer well? 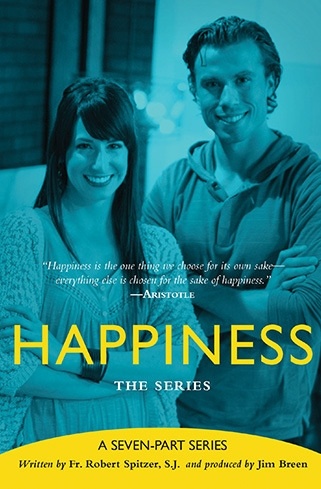 The Happiness series from the Magis Center is an excellent resource for introducing high school students to the fundamental concepts in philosophy of religion that lie at the foundation of Christian theology. Given the plurality of voices students experience today concerning matters of spiritual and religious significance, the Happiness Series provides an approachable introduction to what lies at root of the spiritual question for human experience in general, and the answer to that question in Christ as revealed through scripture and tradition in particular. The material from Magis Center helps the instructor root the significance of the USCCB curriculum in something all students understand: that happiness is the final end in all of our pursuits in life, and that this end finds its ultimate fulfillment not in our own satisfaction, success, or renowned, but our transcendental relationship with God. By understanding of what lies at the foundation of the Christian tradition’s philosophy of religion through a brief introduction to the philosophy of Plato, Aristotle, and Augustine as introduced through approachable videos, notebooks, and other resources, students are better able to appreciate the significance of the Deposit of Faith as articulating the source of this transcendent happiness as revealed in the person of Christ, handed down by tradition, and lived in faith in the Church today. I highly recommend this material as a supplemental resources to any other texts or materials employed in a high school theology curriculum. Now, I only used the DVD and workbook, but I learned at the Religious Education Congress in Anaheim that there is also a book that goes along with that materiel as well. I briefly paged through that and would probably recommend the Video for all grades, the workbook for Freshman/Sophomores and the textbook for Juniors/Seniors. As someone trained in philosophy of religion and theology I think that we should incorporate more materials in our theology curriculum that address Classical thinking so that students realize that their own questions are not novel, but in fact find articulation in the history of the Christian faith and the Greek philosophical tradition. Thank you again for supplying the materials to us, and I look forward to using it in the future. In these 7 episodes, students will encounter the major ideas and principles underlying their happiness, as well as its two related issues: transcendent eternal life and the purpose of suffering. 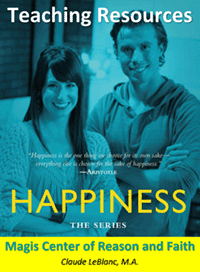 Happiness, the Series – 7 Episode video series. There are 7 Chapters in the workbook, each corresponding to a DVD episode. There are time stamps in the workbook to tell you exactly where you can find particular spots in the video. This series should be a must for every high school student and their parents. Target level, high school Freshman and above. This 7-episode video series is designed to answer the most fundamental questions affecting our lives — our happiness, purpose, dignity, and sense of destiny. A PDF Teacher’s Resource Manual with: detailed lesson plans, prayers, handouts, assessments, additional activities, video clips, and more, all which can be used in a variety of settings and time frames. Get started by selecting the Teacher’s Resource Manual or selecting one of the Lessons. The lesson plans can also be opened directly from the Manual. Get answers to some of life’s most vexing questions and dispel popular misconceptions. For those who believe happiness and suffering are incompatible, Fr. 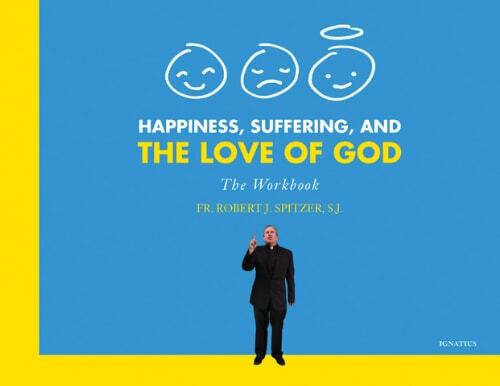 Robert Spitzer’s lectures is a guide towards authentic and lasting happiness. Life-changing.